Third-year physics graduate students Kaitlin Rasmussen and Devin Whitten were settling into their observation work in August on the 2.5-meter Irénée du Pont Telescope atop a rocky mountain in Las Campanas, Chile, scouring for a type of star enhanced by a set of reactions called the rapid-neutron capture process, or r-process. 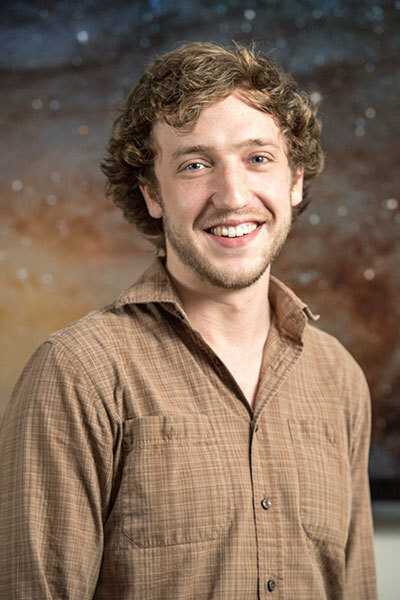 What the two University of Notre Dame students—both advised by astrophysics professor Timothy Beers, Notre Dame Chair in Astrophysics—witnessed instead was perhaps one of the most significant discoveries so far in the field of astrophysics. A stroke of luck for them, a brief flash of gamma rays had been detected 143 million light years away in galaxy NGC 4993, located in the constellation Hydra. And accompanying the bright burst were gravitational waves detected by the Advanced Laser Interferometer Gravitational-Wave Observatory (LIGO). All data pointed to a never-before seen event: the merger of two neutron stars. The event was announced in a series of papers first published online Oct. 16 in Science. Neutron star mergers have proven to be responsible, either in whole or in part, for the formation of nearly half the metals heavier than iron in our solar system. These include gold, platinum, and uranium. “It was pretty amazing,” Whitten said about being present at the observatory in Chile during the discovery. Rasmussen said she immediately called her mom out of sheer excitement. “Calls are pretty expensive from Chile though, so I sent some texts,” Whitten joked. 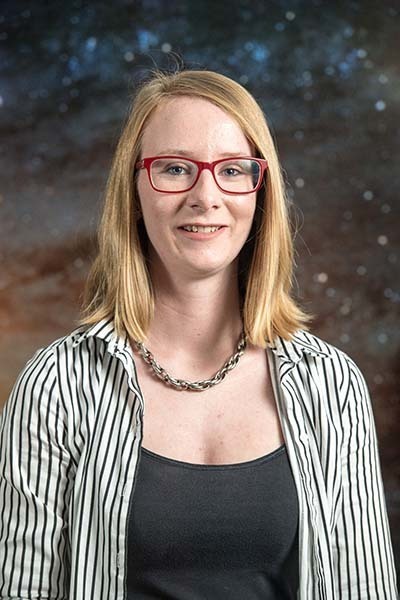 The students had been searching for ancient stars enhanced in r-process elements, one of Beers’ primary research interests, on a telescope owned by the Carnegie Institution for Science. The concept of the r-process was first suggested in 1957. Astrophysicists theorized that the universe’s heaviest elements are formed after a set of reactions, and later suggested this could possibly occur when two neutron stars collide. Neutron stars—the densest stars astronomers can visually observe—result when a supernova collapses and its electrons and protons melt into a neutron core only a few miles wide, yet weighing more than two suns. When two such stars collide, neutron-heavy metals spray outward throughout the universe. The metals become incorporated into the gas clouds of newly minted stars, which is what happened when our sun formed billions of years ago. The same cloud eventually forms planets, like earth, where the metals are also found. Though Rasmussen and Whitten were asked to delay their own r-process-enhanced star search while in Chile, the discovery of the neutron-star collision is fundamental to their work with Beers. Because they were onsite, they assisted with studying the light curves emitted after the event. Along with Beers, who was in Santiago during the discovery, the students are among the nearly 50 co-authors cited in one of the discovery papers published in Science. The newest discovery follows on the heels of discoveries by researchers in the LIGO group, who detected gravitational waves after four different collisions of two black holes. The waves, predicted by Einstein, are often called “ripples in the fabric of space-time,” and their discovery earned the developers of the LIGO detector the 2017 Nobel Prize in physics. Collisions of neutron stars create not only gravitational waves, but also visible light, which is why the students could view this collision rather than detect it through gravitational waves alone. 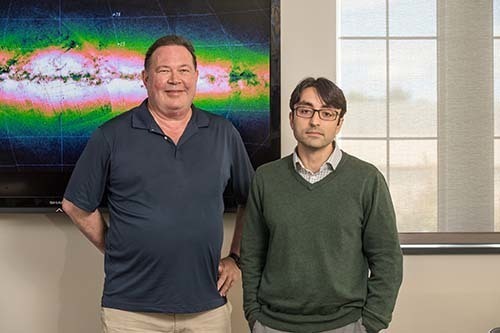 By an equal stroke of luck, Placco was at a conference in New York when another astrophysicist asked him to reduce some archival data for a different gamma ray burst (GRB). Because of previous work Placco had done, he happened to be the only astronomer at the event who could turn out the calculations on that same day. Comparisons with the spectra of the electromagnetic counterpart of the neutron star collision allowed the other team’s researchers to rule out the GRB as a possible final outcome of the August event. Because of his assistance, Placco has been included as a co-author on another one of the papers released about the August collision. “I always tell the students—especially the graduate students—that sometimes it’s good for you to make sure people know who you are and what you do, because you’ll be given opportunities even when you don’t expect them,” Placco said. Now that scientists know neutrons can create the heavy elements through the r-process, they’ll redouble efforts to determine whether these neutron star collisions are the only source of those elements, or if another astrophysical event, like a particularly energetic type of supernova explosion, also has a hand in the process, according to Beers. There’s always that next step in science, when a new discovery unearths even more questions to be explored and answered. Rasmussen and Whitten will move on to answer other astronomical questions and search for even more stars enhanced with r-process elements. But they’ll always have the literal bump in the night that bumped them off one experiment, allowing them to experience a major astronomical event many astrophysicists waited decades to witness. The research was funded by a grant through the Luksburg Foundation, which encourages Notre Dame partnerships with the Pontifica Universidad Católica de Chile. Originally published by Deanna Csomo McCool at science.nd.edu on October 16, 2017.